Great Western Olives is a small family owned olive grove near the Grampians in western Victoria. Frantoio, Manzanillo and Kalamata olives are grown there. The olives are used to produce a cold pressed extra virgin olive oil, rich in anti-oxidants, with fresh aromatic flavours and a mild peppery finish. The oil won a silver medal at the 2010 Australian National Extra Virgin Olive Oil Show. 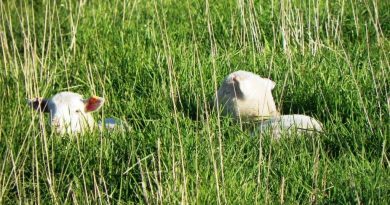 The olive grove is owned and managed by Bill and Helen Francis, and is part of their small farm with native grass pastures and some cattle. 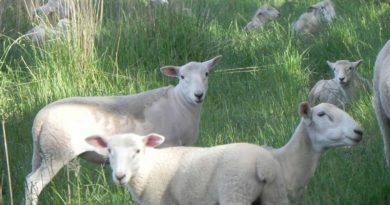 The grove is growing in a native pasture block which is maintained by slashing the grass and weeds and occasional use of herbicide to control grass between the trees. The trees and fruits themselves are generally not sprayed with any chemical. 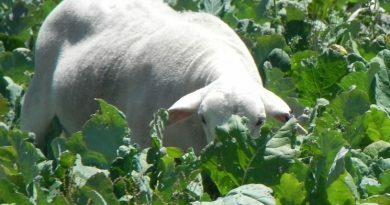 Irrigation is used during the summer and early autumn. The oil is sold in specialist stores in small bottles, mainly in Western Victoria, but is also available via Julie Francis, Bill and Helen’s niece, in bulk, in Melbourne. This comes in 5L tins or 20 litre drums and at a discounted price for the bulk purchase. If decanting from a 20L drum into another container, make sure that the container is well washed, and preferably limits light (e.g. a green or brown bottle or a tin) to stop the quality of the oil from degrading over time. 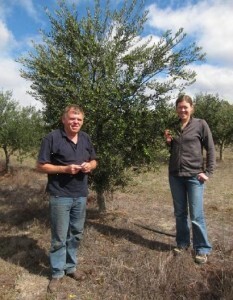 Bill and Julie check olive ripening in the grove at Great Western, Victoria.